Rally Cycling’s Evan Huffman took the biggest win of his career when he safely crossed the finish line after stage 5 from Silver City to Pinos Altos to seal his overall victory at the 31st Tour of the Gila. 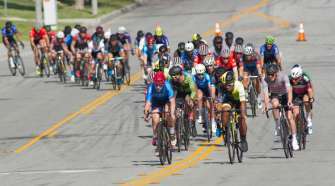 Jelly Belly Pro Cycling’s Sergei Tvetcov finished second to stage winner Jhonatan Narvaez (Axeon Hagens Berman), which bumped the Jelly Belly rider into second place on GC. TJ Eisenhart (Holowesko|Citadel) finished third overall. 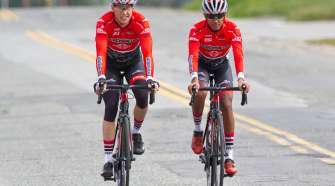 “I was hurting a lot on the climbs, but we had a numbers advantage the whole day,” Huffman said. “At the top of the Gila Monster we had a group of four guys out of 10. I was sitting on wheels, following my teammates who were neutralizing attacks. It wasn’t an easy day but it would have been a lot harder without my teammates. 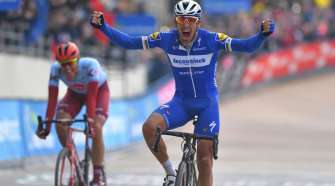 Stage winner Narvaez continued to show good form after winning the Circuito International in France. It was a grueling finale to an already tough week of racing for the UCI men. With 100.6 mi (161.9km) and 9,131ft (2,783m) of climbing, the Gila Monster RR once again lived up to its name as one of the hardest courses in North America. The profile didn’t deter the riders from starting off the race in an aggressive fashion. Attacks flew off the front from the word, “go” but nothing got any traction until around 30 km into the stage when a group of 15 including Eric Marcotte (Cylance), Travis McCabe (UHC), Ruben Companioni and Joe Lewis (Holowesko) slipped off the front. Working well together, the large group gained a max of 2 minutes 15 seconds, but it started to fracture as the road turned upward. Efren Santos (Canel’s) and James Piccoli (PPB Racing) became the new leaders until a puncture forced Piccoli back into the peloton. Because of the pace set by the Rally team, Santos was reeled in, and with less than 30km to go, the battle for survival began. About 10 riders were left and Rally taking control. Eisenhart threw in an attack with 1.5km left, but Rally neutralized the Holowesko rider’s efforts. On the last few meters of the final climb, Narvaez capitalized on Rally and UHC tactics and finished on top. Gavin Mannion (UnitedHealthcare Pro Cycling) finished third on the day and was his team’s big hope for a win, but his team struggled to match Rally’s dominance. After the stage, Rob Britton (Rally) finished in the lead of the KOM competition, McCabe won the sprint jersey and Narvaez’s efforts shot him to the top of the best young rider classification. 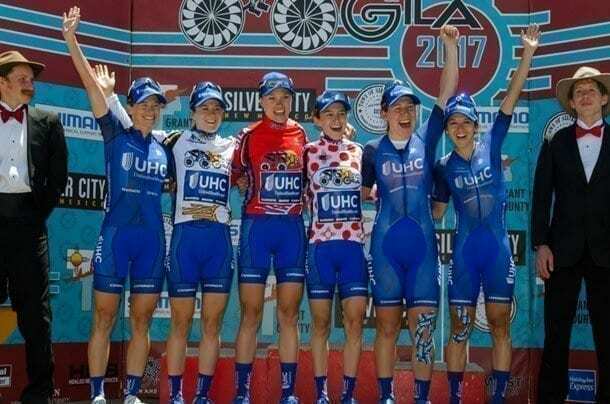 UnitedHealthcare Pro Cycling’s Tayler Wiles sealed overall victory at the Tour of the Gila after claiming second to her teammate Katie Hall on the final stage of the five day race. Hall’s powerful performance on the Gila Monster stage bumped her to second on GC while Leah Thomas (Sho-Air Twenty20) held on to her 3rd place overall. It was UnitedHealthcare Pro Cycling’s race to lose before the final stage from Silver City to Pinos Altos. The leader jersey never left the team’s camp, passing from Hall to Wiles on stage 2 and staying on the 27-year-old’s shoulder for the rest of the week. Despite the Gila Monster road race daunting profile, no team could unseat UnitedHealthcare Pro Cycling’s dominance over the 66-mile (106km) march over five QOMs, complete with an unforgiving climb to the finish. Megan Alderete (Supermint HB) was the first rider to break the elastic on the field. Sofia Arreola (Sho-Air) was quick to join, but the duo didn’t gain much traction and was reabsorbed when Alderete’s teammate Lizzie Williams tried to bridge. Kaitie Antonneau (Cylance), Nicolle Bruderer (TIBCO) and Beth Ann Norton (Visit Dallas DNA) were the next group to go off the front. The trio gained more than 3 minutes before Norton fell back into the peloton. Wiles and Hall caught and passed the remaining breakaway riders up the final climb and paced each other, gaining almost 2 and a half minutes, while the remaining riders struggled to limit their losses. Over the line, Hall finished six seconds ahead of Wiles and put a big enough effort in to claim the polka-dot jersey. Winder sprinted to third place, sealing the UnitedHealthcare Pro Cycling podium sweep and solidifying her lead in the best young rider competition. Jamie Gilgen brought home the green jersey for Rise Racing.